Good question, does this help? Explore our frequently asked questions to get fast answers to your questions. Is Gather a form builder? We’re a ‘hybrid’ option because it delivers the best results. We start by looking at your CRM and work backwards into the app to create a ‘template’ customised to your business which will allow for any type of conversation or data to be captured. This means you can utilise conditional logic, in a fast process with accurate validation – something that can’t do with a form builder. Gather is designed to work fully offline. All data is stored securely on the device until an internet connection (3G, 4G, Wi-Fi) is available. Once online, your data automatically uploads to our portal. What operating systems is Gather compatible with? Gather is compatible with Apple (iOS) and Android operating systems and is accessible form the Apple and Android app stores. However, Gather isn’t compatible with the Windows operating system but will work on Microsoft hardware running the Android operating system. Can we use a mixture of different mobile hardware? Yes. Gather can be deployed across a wide variety of mobile hardware to include virtually all smartphones and tablets in the market today. Can I create guest lists and check them in? You can upload a list of guests into the Gather portal which can then be synced down to each device that has a secure Gather login. Once synced, this guest data is available offline for search and select of any guest, present the data on-screen and submit as a ‘check-in’. Yes. We can place signature fields onto any template where you need that extra validation, such as indemnities. These are then stored in the Gather Portal but can also be placed onto re-created templates with data ‘in-situ’ as a .PDF that can be pushed into your CRM system as an attachment. What data validation is in Gather? Can I link captured data with campaigns or events? Yes. One of the biggest benefits to our data capture software is the ability you have to easily label collected data from the event source and the user in your team who collected this data. Not only is this important for GDPR (to ensure an audit trail per individual data submission) but it also allows for granular analysis of event ROI. How does Gather provide for GDPR compliance? Gather is fully GDPR compliant. To start, we act only in the capacity of Data Processor for each client meaning we do not use, re-use or re-sell any data we collect. Whatever package or customisation you choose, Gather is 100% GDPR compliant for permissions. We can reflect your exact business approach to GDPR compliant permissions with customer privacy and/or permissions statements, accept/reject terms and prevention of data being submitted. We can also include post-capture emails with double opt-ins and tracking links to your permissions centre. How quick is it to capture the customer’s data? All of your data and reports are held in the Gather secure online portal. It can be accessed via any web-enabled browser, or the app itself, using secure logins. Since Gather uploads data in real-time, you can see your data within seconds of capture. Gather has data encryption and security applied to the entire data journey from app to cloud. On device, the data is held in an encrypted state. Data is passed to and from our Portal, via a secure encrypted connection over the internet. Once in our Portal the data is held in an encrypted, secure, fully redundant Tier1 hosting facility inside the European Economic Area (EEA). We are ISO9001 and ISO27001 certified and routinely conduct CREST accredited penetration tests. Our clients include global businesses with stringent security and supplier appointment criteria. Can Gather integrate with my CRM system? Are there any hidden or capped usage charges? No. Once you’ve have purchased Lite, Pro or Enterprise, the package includes all of the features listed for each package under our Pricing page. It also includes the full end-to-end experience, from unlimited data collection to unlimited data extraction, with no additional charges. What countries is the app accessible from? How Does Business Card Scanning Work? Unlike some businesses that send photographs of your business cards off to be manually typed up, potentially leaving the EU, our business card scanner module uses Optical Character Recognition (OCR). This OCR technology scrapes the data from a business card, even offline, validates the data to ensure accuracy and enters the applicable data into the right fields. There are also embedded editing tools to each template meaning you can move and change data without needing to access the device keyboard. What’s the difference between OCR business card scanner and the image capture? The OCR technology translates the text in a photograph to editable text mapped to the appropriate fields, the image capture feature enables you to add an image file to a customer or data record. Can I add images from my phone to a capture record? You cannot add existing images from your phone to a data capture record, you can only add images taken through the app. Can I use the same login on different devices? You can use the same login on multiple devices, if you use different logins for each user then you can track who is capturing what data, a key part of GDPR compliance. How quickly can I start collecting data? Once you’re from is live you can begin collecting data immediately. How quickly can I see my data? If you have an internet connection your data is pushed up to the portal and then to your CRM in real time. If you don’t have an internet connection the data will remain on your device and be uploaded once you gain an internet connection. I want to add an extra custom question – can I do it myself? 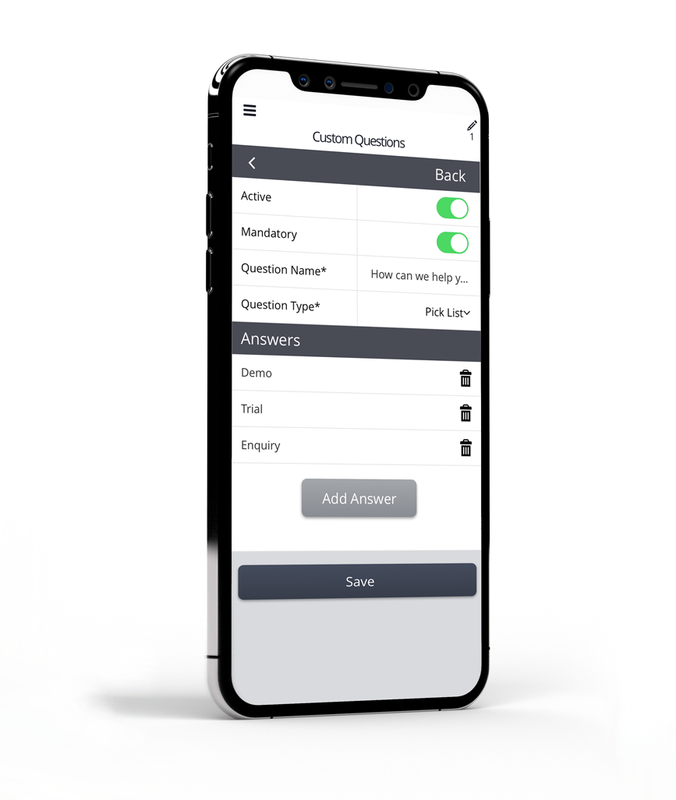 Within the app you can add and edit your own questions and data entry fields on a per device basis. Is there a limit to the amount of data I can capture? Whatever package you decide to purchase, we don’t limit how much data you can capture once you’re at an event. Whether you collect 10 leads or 10,000 leads, Gather won’t ever put a cap on how much you use our app. How far can the software be customised? Gather can reflect every detail of your business corporate identity. This includes logos, colours and fonts and even as far as your own white labelled desktop icon and app store instance. We encompass the entire user experience, content and back-end database interaction. There is no limit to what you can change. Do upgrades cost the same on Lite, Pro and Enterprise? Upgrades are charged at a fixed rate across all packages. Gather is a scalable platform so upgrades are priced individually to ensure you only pay for what you use. Pricing increases from Pro to Enterprise as our Enterprise version provides your own app in the stores (Apple App Store and Google Play Store), larger user volumes, ‘pull’ integration and your own custom modules to be developed. Is there a limit to the number of events or campaigns I can create? All of our package subscriptions allow for unlimited event and campaign creation. So whatever package you decide to purchase, we don’t limit how many events or campaigns you attend or run. Gather won’t ever put a cap on how much you use our app. We do however offer a pay-as-you-go pricing option for Gather Lite meaning you can have a reduced price for one single event – a great way to try the software. Can I represent two brands at one event? Yes. Our software allows for flexible in-app branding, we can adjust branding down to individual user level. Many of our clients have multiple brands represented at the same event or location – ask for a demo to see how. How can Gather be scaled to a global team? The Gather Portal includes what we call a ‘region structure’. The means we can create regions to reflect each unique area of your business, such as geography, product, department, etc. Each region structure is unique to each client in our system with multiple levels allowing you to control the distribution of forms, reports, campaigns, features & functions, branding & permissions down to each user. How do I add a campaign? Add a campaign by logging in to the Gather portal, click admin, then campaigns and then press the add button. Enter a code, description, start date, end date and time zone and push submit. Does the software timeout if left idle? Yes. For security purposes the Gather app can be set to time out for any time period you choose to set. How do I receive updates to the templates? Once they are deployed by Gather, sync your app and they will be pulled down. You need to contact us to add users. Our support lines are open from 9am to 5:30pm, Monday to Friday (UK Time: GMT/BST) where one of our technical support team will be standing by to deal with any queries you have. Can you provide onsite support? The type of support and training we offer is flexible to your package and company. We can offer in-person, telephone and remote video training. I can’t login– what do I do? Resetting your password is the most common solution to login issues, try to do this by visiting the Gather portal and clicking the “forgotten your details?” link. If you are still having issues, contact us. How do you issue updates to the app? Updated to the app can be installed through the app store by selecting update app. How can I get support if I need it? Gather has been in-market for over 10 years, meaning it is a very stable and proven platform. However, we pride ourselves on our service and our support team is contactable by telephone or email. Typically, we ensure all clients are setup, configured, trained and ready before use. Once an event is live, support is available by either telephone or email straight to our support desk. How can I get in touch if I need help?